Saint Alexander was sent to the First Ecumenical Council in Nicaea as the delegate of Saint Metrophanes, Bishop of Constantinople (see June 4), to whose throne he succeeded in the year 325. 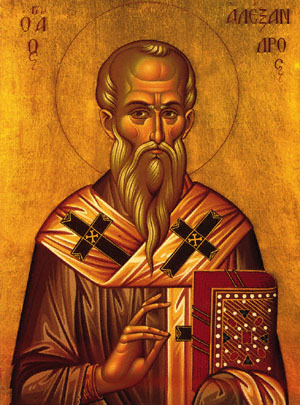 When Arius had deceitfully professed allegiance to the Council of Nicaea, Saint Alexander, knowing his guile, refused to receive him into communion; Arius' powerful partisans threatened that they would use force to bring Arius into the communion of the Church the following day. Saint Alexander prayed fervently that God might spare the Church; and as Arius was in a privy place relieving nature, his bowels gushed forth with an effusion of blood, and the arch-heresiarch died the death of Judas. Saint Alexander was Bishop from 325 until 337, when he was succeeded by Saint Paul the Confessor, who died a martyr's death at the hands of the Arians (see Nov. 6). The Saint John commemorated here appears to be the one who was Patriarch during the years 562-577, surnamed Scholasticus, who is also commemorated on February 21. He was from Antioch, where he had been a lawyer (scholasticus); he was made presbyter, then was sent to Constantinople as representative (apocrisiarius) of the Patriarch of Antioch, and was appointed Patriarch of Constantinople by the Emperor Justinian. Saint Paul was Bishop of Constantinople during the years 687 - 693, in the reign of Emperor Justinian II, and presided over the Quinisext Council in 692. Kontakion of Alexander, Paul & John, Pats.Of Const. Aflame with love for Christ, ye took His yoke upon yourselves; and since ye emulated well His life upon the earth, ye were also made partakers of His great glory. Now, O Fathers Alexander the divinely-wise, wondrous John, and glorious Paul, ye stand before His throne; wherefore, fervently intercede with Him to save our souls. Share the feast of Alexander, John, and Paul the New, Patriarchs of Constantinople with an icon greeting ecard.